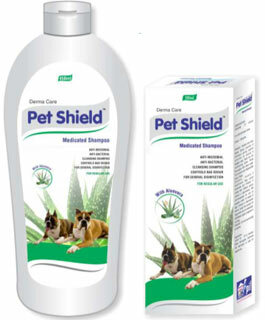 Pet Shield Medicated Shampoo kills ticks & fleas, prevents infection, Cleans the coat thoroughly, helps in conditioning & deodorizing skin coat. Leaves coat lustrous. Treats non- specific dermatological conditions. Controls bacterial or fungal skin infection. Removes scurf & enhances coat re-growth. Application: For dog use only. Wet animal thoroughly with luke warm water . Apply small quantity of shampoo (10-12 ml) and work into a rich lather. Apply more shampoo if required. Ensure shampoo is thoroughly rinse. Repeat after every 7 days.